Why were you in California? If you read our About page, you will see that I am originally from California, and if you join the Marine Corps right after high school, they will send you to the farthest reaches of the known world— North Carolina. Most of my family still lives back in Santa Maria, so Mrs. Angus, Small Fry, and I try to get over there every few years or so. It has been about 2 years since I have been back. Where exactly is Santa Maria? Santa Maria is a city in Santa Barbara County. It is approximately 150 miles northwest of downtown Los Angeles. The area that it resides in is called the Central Coast and U.S Highway 101 goes right through the middle of it. To put it in general terms, its about 15 minutes to the beach, 30 min to the mountains, 45 min away from Santa Barbara, and 2 1/2 hours away from L.A. It was really easy to do whatever you wanted growing up there, being so centralized and close to everything. Where did you grab a burger at? 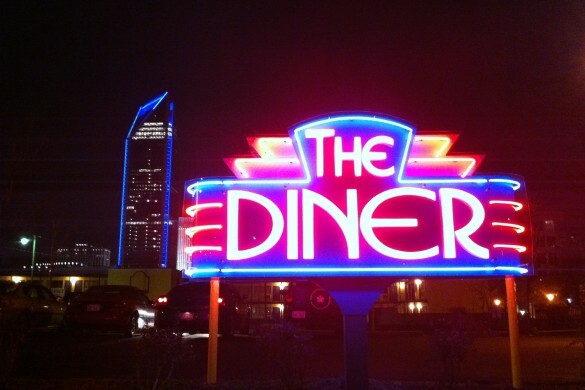 This being our first On The Road review, I wanted to go to the place where I had my very first burger, Tom’s Take Out. 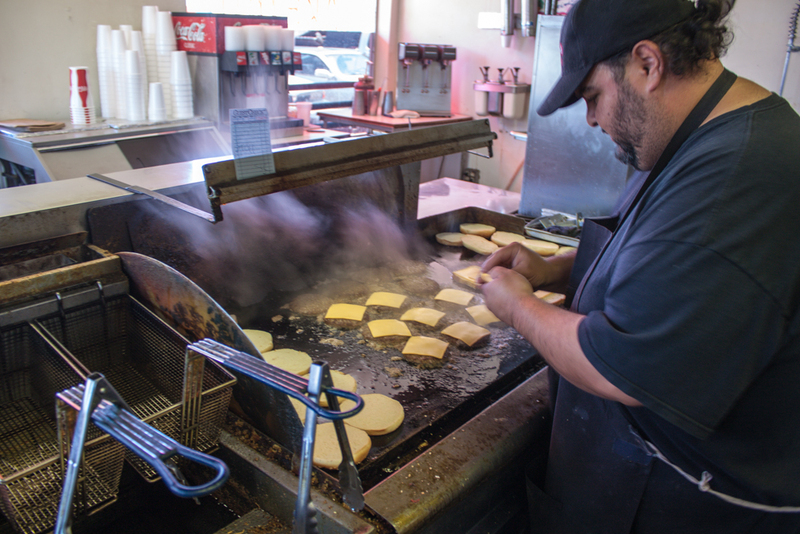 Tom’s has been serving amazing fresh burgers since 1968 (and serving me since 1982). Wait, is that a muffler shop attached to it? Haha yes! That’s where it all started with me. My father rebuilds classic muscle cars and he used to go to Carl’s Muffler Shop to get all of his custom exhaust work done. We would drive what he was building at the time, drop the car off, and walk into Tom’s for a bite to eat. Now I cannot confirm this to be accurate but, I swear that when I was little, I saw a guy turning wrenches in the muffler shop one minute and then the next he was flipping burgers on the grill. This is not the way it is today (both businesses being totally separate), but I love thinking about that memory and wonder to this day if that guy was pulling a double shift. 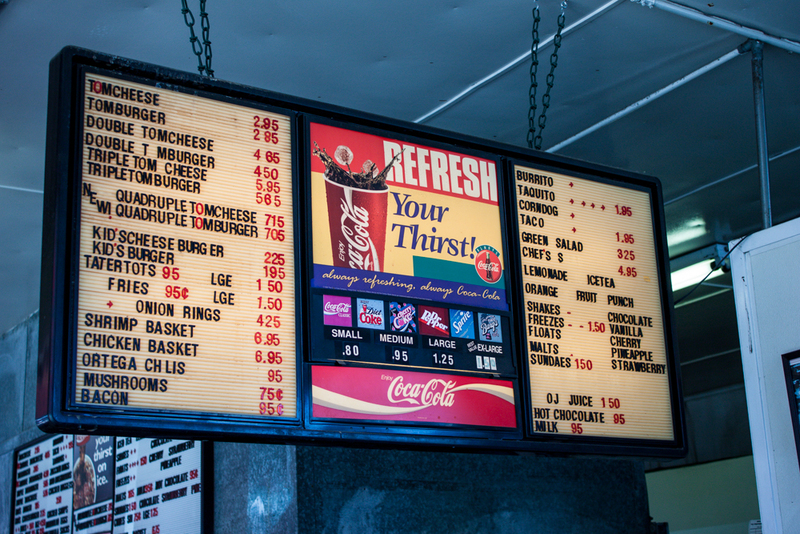 How do you order at Tom’s? 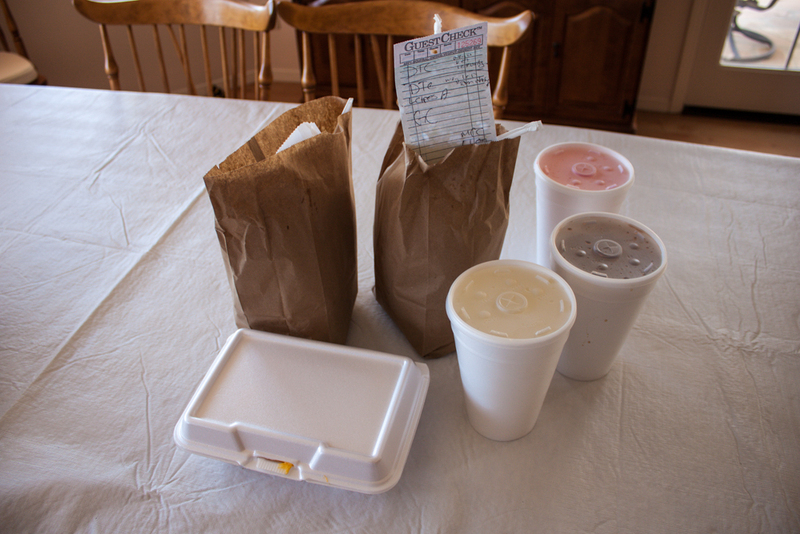 Being a joint that is specifically take-out, Tom’s has a walk up window that you can…er…walk up to. So if you are walking by or just jumping out of your car real quick, this is the option for you. 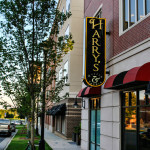 You can also walk inside Tom’s and order there for a more personable experience. 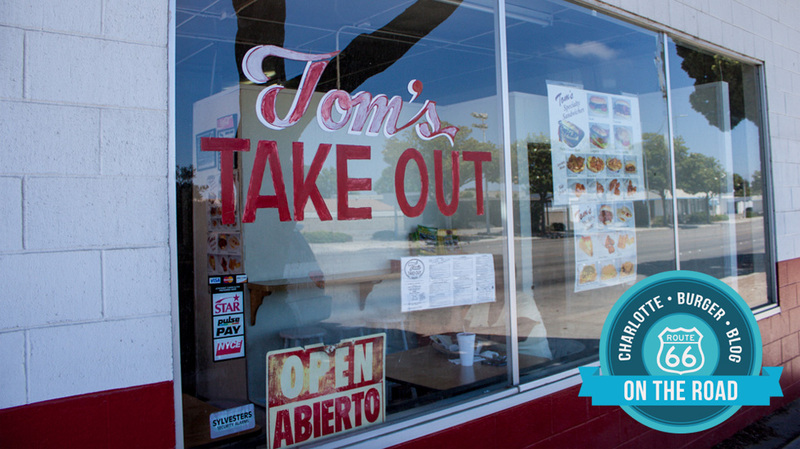 Tom’s has been owned by the Velasquez family since 1977 notably run by the two brothers Mark and Michael and their father Mike. Since we started going there we would walk in and get greeted kindly by Mike and made fun of by Mark and Micheal. 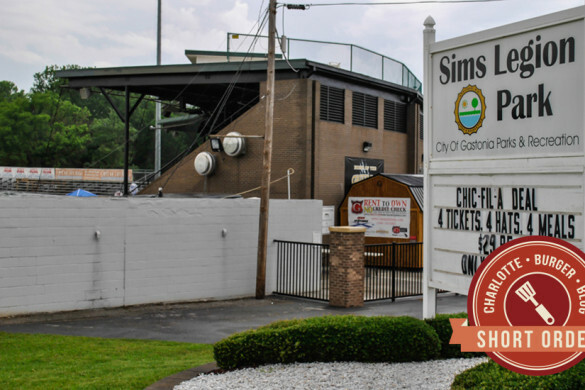 You find that it is one of those places that if you can’t handle a little banter (or dish it out yourself) you were going to have a hard time ordering a burger. My dad, Jesse, and my brother, Dom, are notorious for making fun of you, so usually it was us who was laughing in the end. It is all in good fun and that is what Tom’s is doing. Bringing fun and conversation to a normally quick ordering dialogue. I’m guessing you ordered a burger right? Wait, does that menu have a burrito, chilis, and taco for sale on it? Uh, yeah. 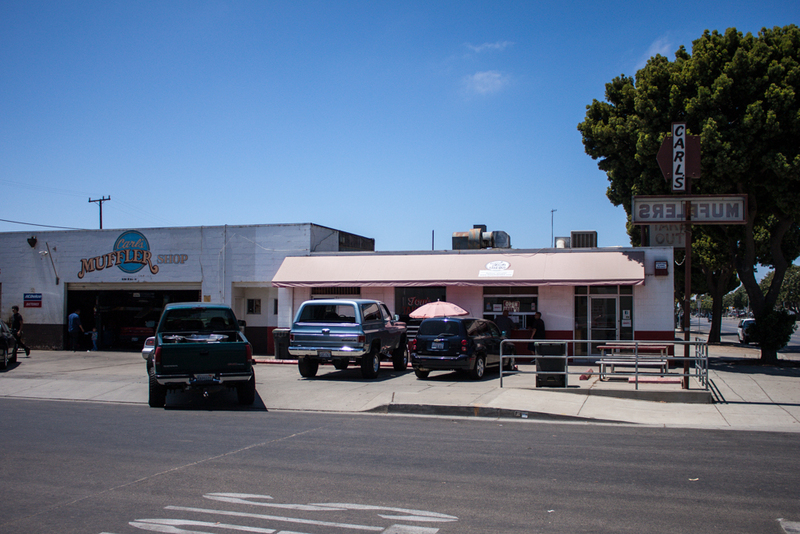 You find that a lot of mom and pop burger joints here in Santa Maria also provide Mexican cuisine options. I mean your going to have Ortega chili’s on you’re burger if you’re Mexican right? Well, my Dad did (they’re too hot for me…). There was actually a joint here in town that when you ordered a burger you received a small burrito instead of fries. I am totally not joking right now. So how is the Double Tom’s Cheeseburger made? 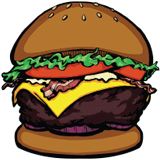 As I was saying before I was rudely interrupted, all Tom’s burgers are custom made to your taste with fresh, ¼ lb. all-beef patties, lettuce, onion, tomato, pickle, Tom’s Special Sauce on a sesame seed bun. (I ordered mine without pickles and onions of course). 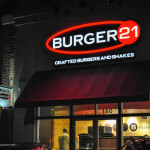 We discussed this before here on the Charlotte Burger Blog but there is something to be said about a cooked-to-order burger on a grill that probably has not been cleaned in all the years that it has been in service. And that something is nothing short of glorious. 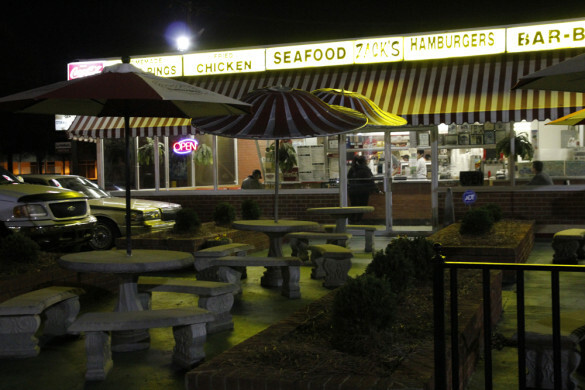 Tom’s is strictly a take-out joint but that doesn’t mean they don’t offer seating for you to enjoy a burger there. There are a couple of tables inside and a few wooden picnic tables outside. It was quite busy (as always) when we were there so we opted to take it home. It’s that ghost of burgers past that gives it that wonderful juicy taste (with a hint of exhaust fumes from next store of course). The lettuce was iceberg and gave it a nice cold crunch, while the cheese was in-between each layer and gave it a welcome chewy consistency. The buns are toasted with a spread of “Tom’s Special Sauce” (dirty jokes aside…) and really rounds out this amazing and wonderful tasting burger. Now I didn’t always have a burger here at Tom’s. I only started eating them when I was about six. I had to build myself up to the massive burger like any ol’ lad my age would. So I worked my way up with their equally amazing grilled cheese (This is what I got Small Fry. *Sniff *Sniff *Sob). I also ordered a side of onion rings and chili cheese fries, because they are amazing and that is “just what you do when ordering a Double Tom’s Cheeseburger.” My brother Dom wrapped it up perfectly. To the heartache of my younger brother (because he didn’t get one), I did and it was comped by one of the brothers, who was there cooking, Michael. 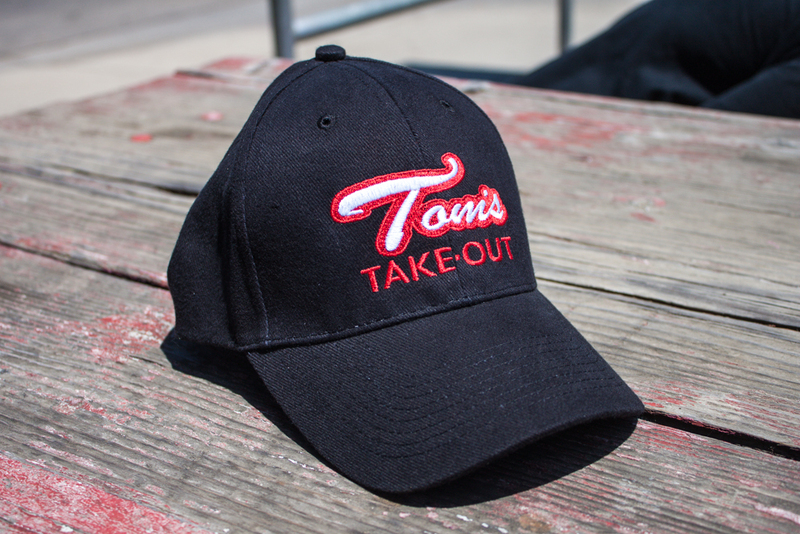 I got a sweet Tom’s Take Out hat. I wear it everyday now. 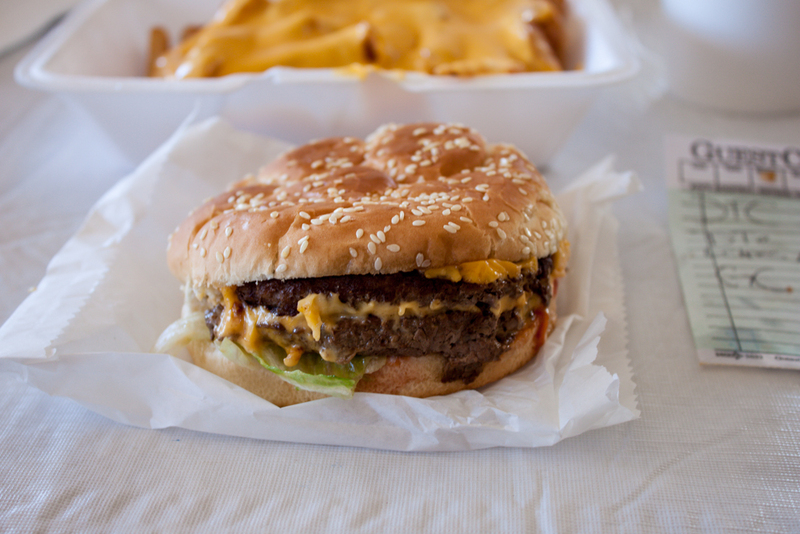 Do you make it a point to always grab a burger from Tom’s when visiting Santa Maria, CA? Yes. Not only because they have wonderfully amazing awesome burgers, but because of the memories that Tom’s holds for me. My father and I used to go to Tom’s every Saturday afternoon and we still eat there together when I visit. Going to Tom’s with my Pops are some of the best times of my life, because I knew when we would go to Tom’s it would just be my dad and I and no one else. These places hold much more than great food, they hold great relationships just like the one I have with my father. I cannot wait until one Saturday afternoon that Small Fry and I just go off and enjoy a great burger together, just the two of us.